A Japanese government panel Wednesday June 25, 2013 approved the world’s first clinical research using iPS cells. Massayo Takahoshi, M.D., Ph.d will serve as head of the clinical study in Kobe Japan. Six patients with wet AMD will have skin cells taken and genetically reprogrammed to become iPS cells. These cells will be modulated to grow into RPE cells which will take 10 months. The sheets of the RPE cells will then be transplanted into the eyes under the retina of patients who have had abnormal blood vessels removed. These patients will then be monitored over the next four years to determine how well the implants have performed and whether the body has accepted them. We will all benefit from the information obtained about minimizing tumorigensis from the induced genetic mutations and possible viral contamination regardless of what level of efficacy is attained. 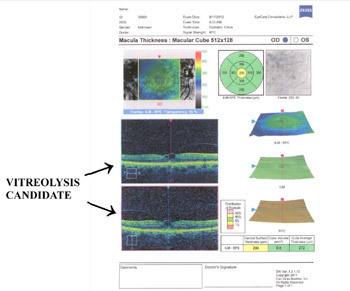 Development of OCT (optic coherence tomography) has help clinicians gain a better understanding of the critical role played by the vitreous in macular and retinal vascular diseases. With early-stage PVD (posterior vitreous detachment), fibrocellular organization of vitreous remnants left on the retinal surface during vitreoretinal separation is the most likely cause of idiopathic epiretinal membrane. Recently, two, Phase-3 clinical trials of ocriplasmin in patients with symptomatic vitreomacular adhesions were completed. Vitreomacular adhesion (VMA) at the macula causes metamorphopsia or visual distortion. Ocriplasmin by ThromboGenics is the only agent that induces both liquefaction and separation of the vitreous from the retinal interface. Pharmacologic resolution of VMA at 28 days was 26.5%. Placebo group (p‹0.001) was 10.1%. If patients with epiretinal membranes were excluded, 34.5% versus 14.3%. Vitreous surgery currently remains the gold standard for treating significant vitreomacular disorders and likely will continue to be the preferred treatment for some time. The perfect vitreolytic drug capable of inducing PVDs consistently with a clear retinal surface and no toxicity concerns would be the preferred treatment. The following article, Sustained Increased Intraocular Pressure Related to Intravitreal Antivascular Endothelial Growth Factor Therapy for Neovascular Age-Related Macular Degeneration (J. Glaucoma; Volume 21, Number 4, April/May 2012), makes note of increased intraocular pressure following anti-VEGF drug therapy that we have noted in our practice as well. It appears that after seven (7) shots, there is an increased risk of patients developing sustained elevated intraocular presure, which they have never experienced in the past. 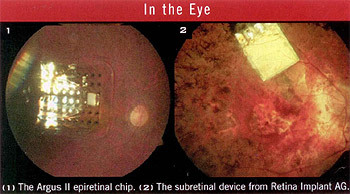 The second observation is that it appears patients with an open capsule have an increased risk over patients with intact capsules for this sustained increased intraocular pressure. Most patients respond well to medical therapy with eye drops over time as the pressure goes down, but a few may proceed on to require filtering bleb surgery. Proposed etiologies for the elevated pressure have been looked for. Researchers began looking for microscopic particulate contaminates. It has been thought that the molecular weight of the drugs may play a role in a blockage of the trabecular meshwork as well as some people thinking that the lubricant primarily used in tuberculin syringes was the culprit. This is the reason that many compounding pharmacies no longer send their drugs in tuperculin syringes. At this point, the definite etiology for the pressure rise is unknow but is under continued investigation. It is important to note that this is a secondary complication with Avastin, Lucentis, and Eylea therapy that is just now coming to the forefront. If we can answer any of your questions regarding this form of therapy, please feel free to let us know. We only order our Avastin (bezacizumab) from a local compounding pharmacy, accredited by the Professional Compounding Accreditation Board, who receives their supply directly from Genentech, the manufacturer of Avastin (bezacizumab). Each order is shipped in FDA-approved cartons directly from the manufacturer with the words “Genentech” or “Genentech – A Member ofthe Roche Group” printed on the packaging. FDA-approved Avastin (bezacizumab) contains a six-digit lot number on the product’s packaging and all packaging is printed in English. All lot numbers are logged and confirmed with Genentech as the product is received by the compounding pharmacy. Counterfeit A vastin (bezacizumab) has letters in the lot numbers and is printed in multiple languages instead of English. Authentic Avastin (bezacizumab) does not have letters in the lot numbers. The counterfeit product packaging does not come close to looking similar to authentic A vastin (bezacizumab) packaging. We are certain that our local compounding pharmacy is giving us only FDA-approved Avastin (bezacizumab) direct from the manufacturer. If you have any further questions, concerns or comments, we will be happy to discuss this matter further with you.